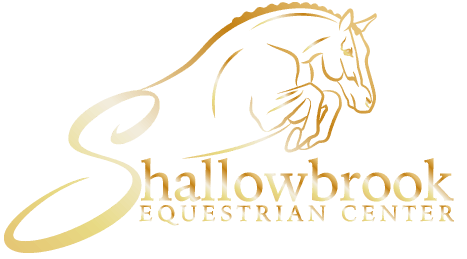 Shallowbrook Equestrian Center is situated on a beautiful 50-acre property located at 247 Hall Hill Rd Somers, CT. The facility provides unsurpassed accommodations with 2 large indoor arenas that are directly accessible from the barn, multiple outside riding arenas, a large grass polo field to ride in and ample turnout paddocks. Permanent, matted box stalls are available for year-round boarding, and clients have access to a large tack room, grooming/wash stalls, multiple storage areas, and a heated/air-conditioned observation lounge with Wi-Fi access. Trainers and caretakers live onsite providing 24 hour security and horse care. With its immaculately manicured landscaping and beautiful surroundings, Shallowbrook Equestrian Center offers its customers an unparalleled equestrian experience. One stall per horse with bedding. Daily turnout as permitted by weather. Supplements administered if supplied. If feeding more than one supplement, they must be combined and put in tupperware containers. Application of fly spray if supplied by owner, turn out boots as needed.